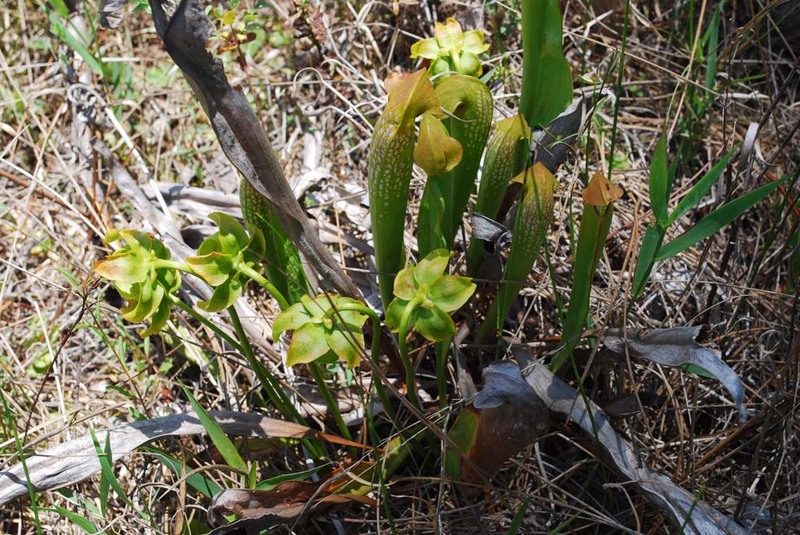 My wife and I were in good fortune today: A park ranger and a volunteer took us by 4-wheeled ATVs—into a part of the park that is not open to the public—to see blooming hooded pitcher plants (Sarracenia minor, member of the Sarraceniaceae family). 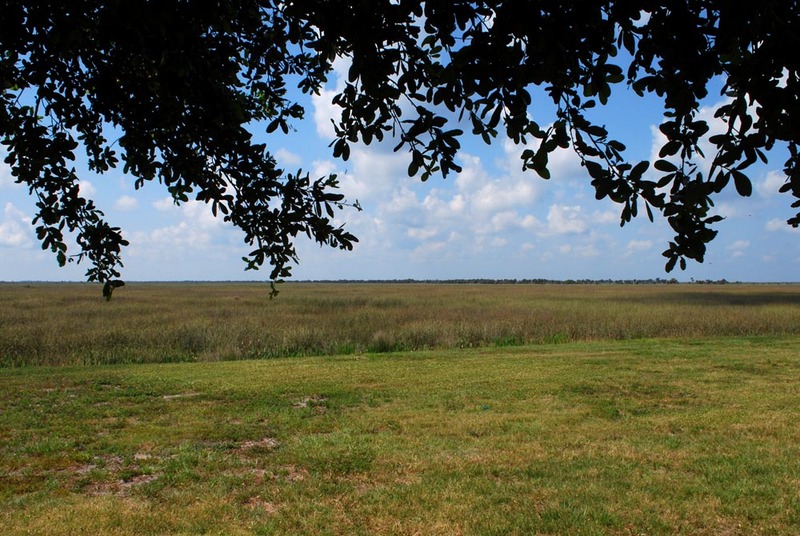 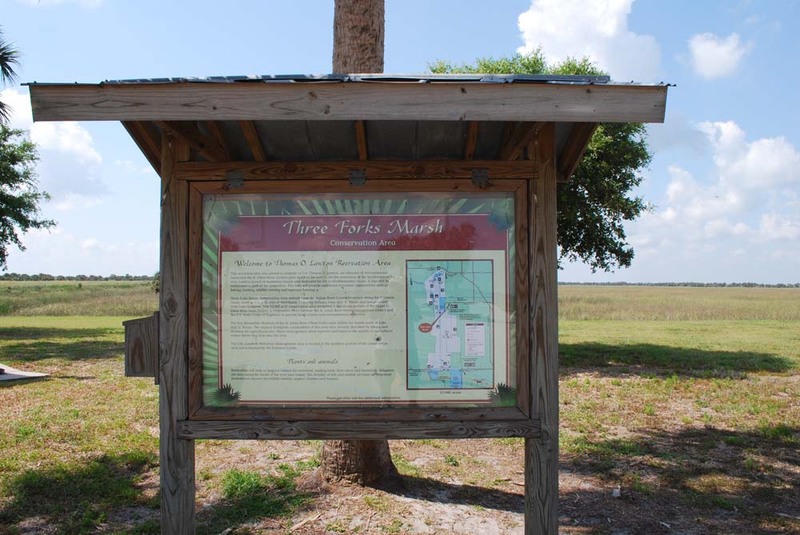 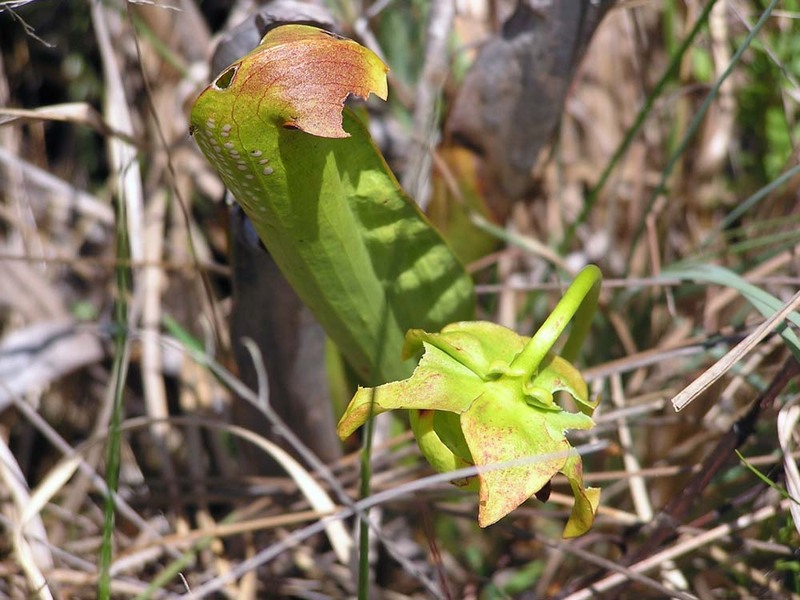 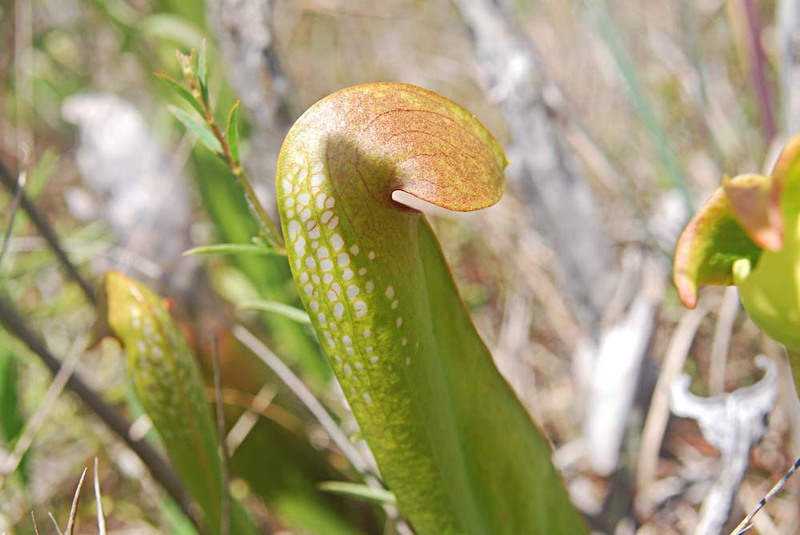 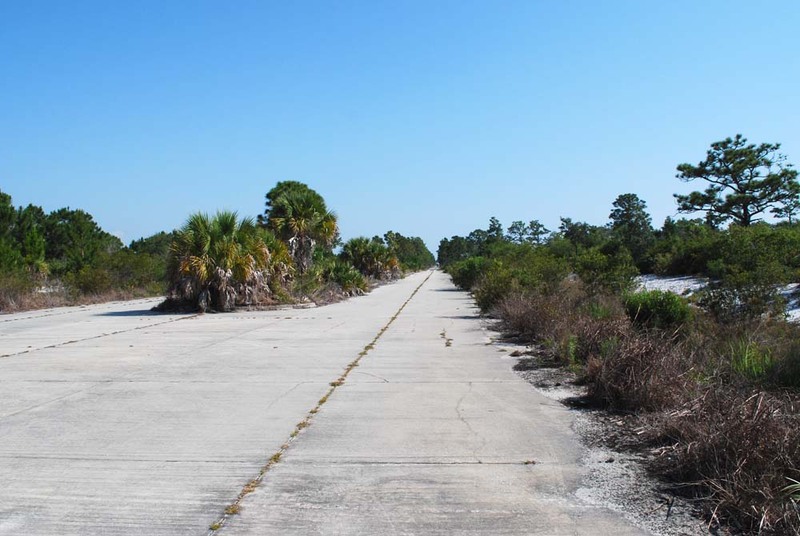 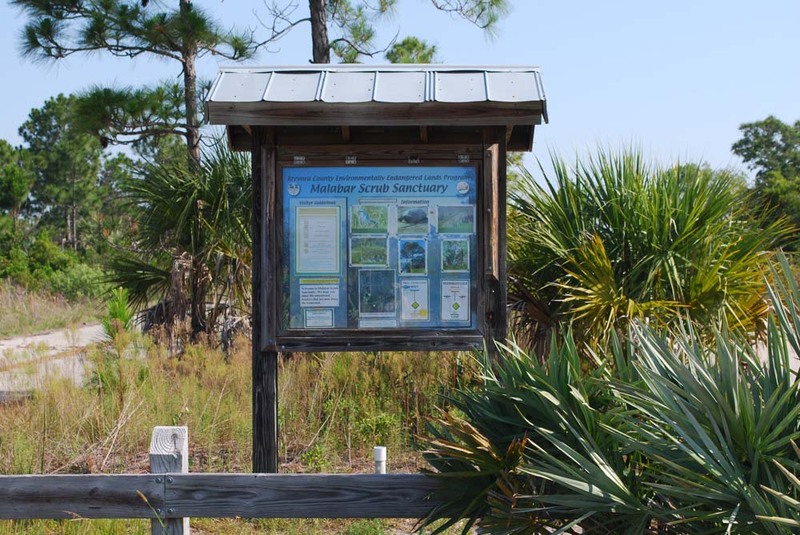 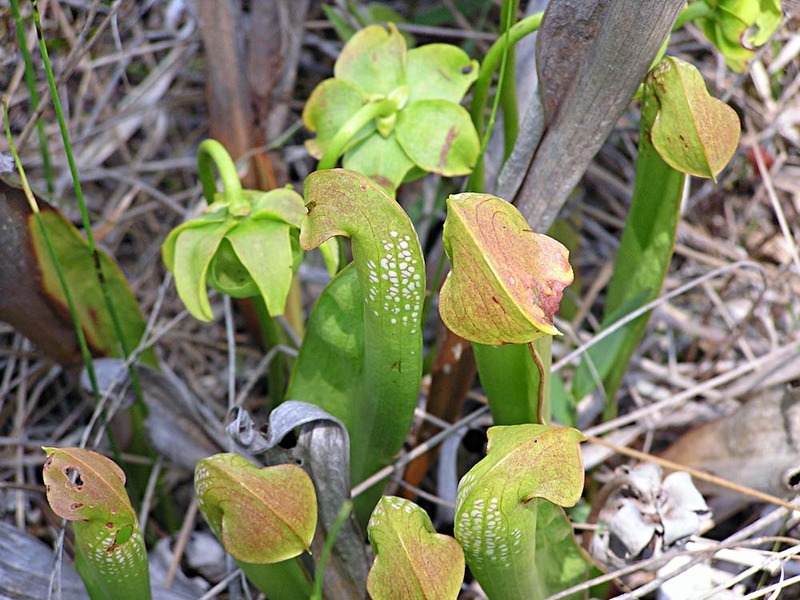 Hooded pitcher plants are protected and officially listed as Threatened in Florida. 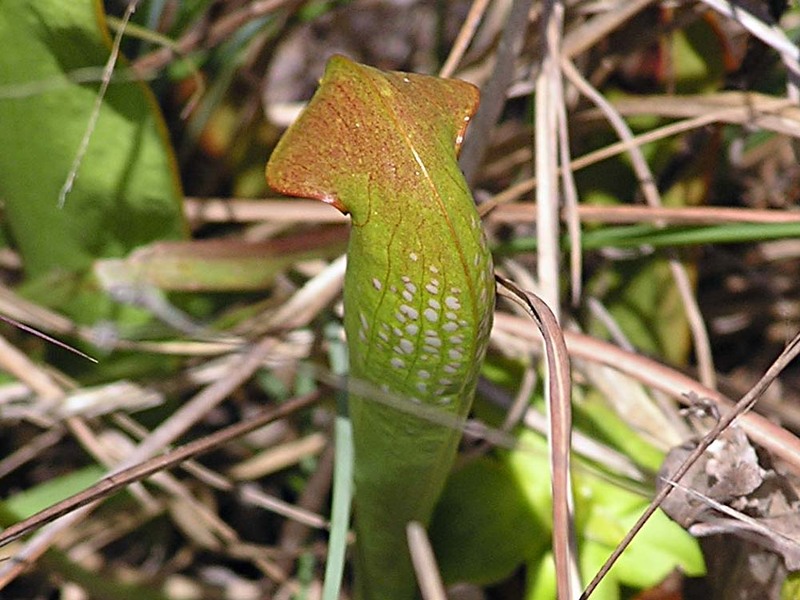 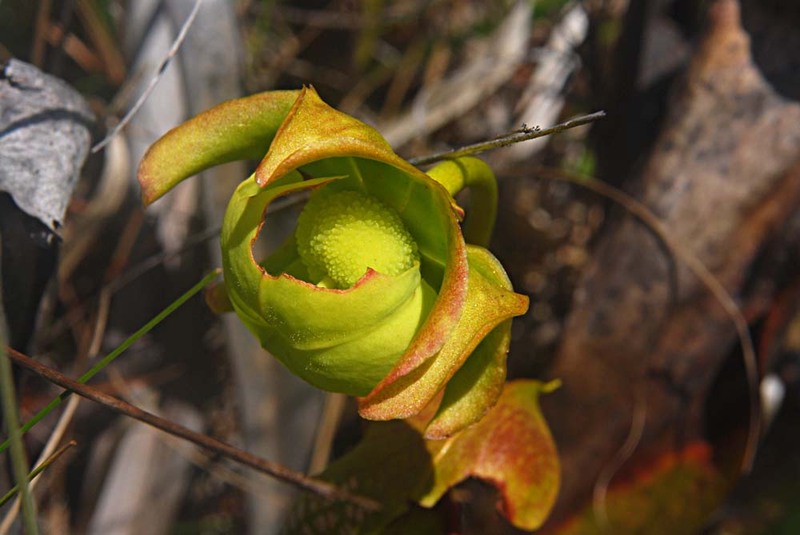 Of the seven species of pitcher plant in Florida, this is the only one found in Brevard Co. Six of the seven are listed as Threatened or Endangered. 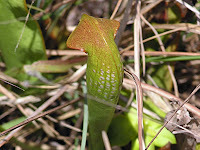 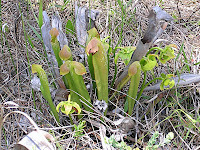 The hooded pitcher plant is found only in Florida, Georgia, and the Carolinas. 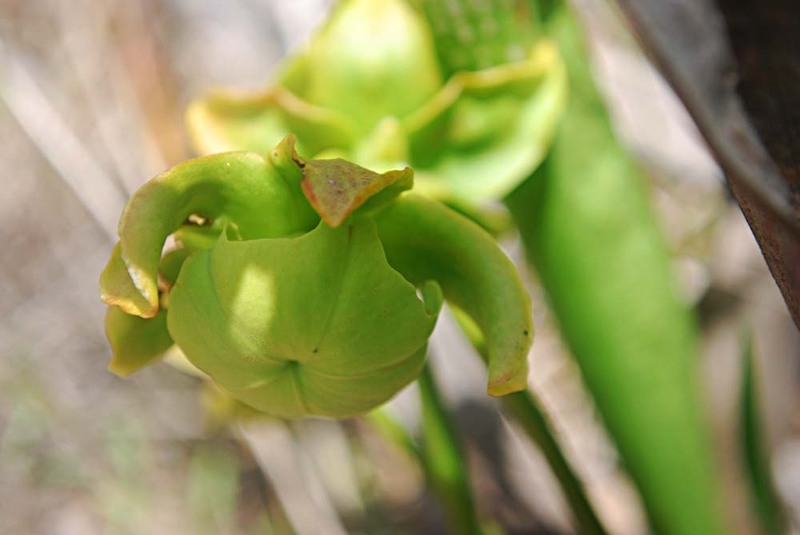 Following is some information I found online about pitcher plants and, in particular, hooded pitcher plants and their translucent "windows." 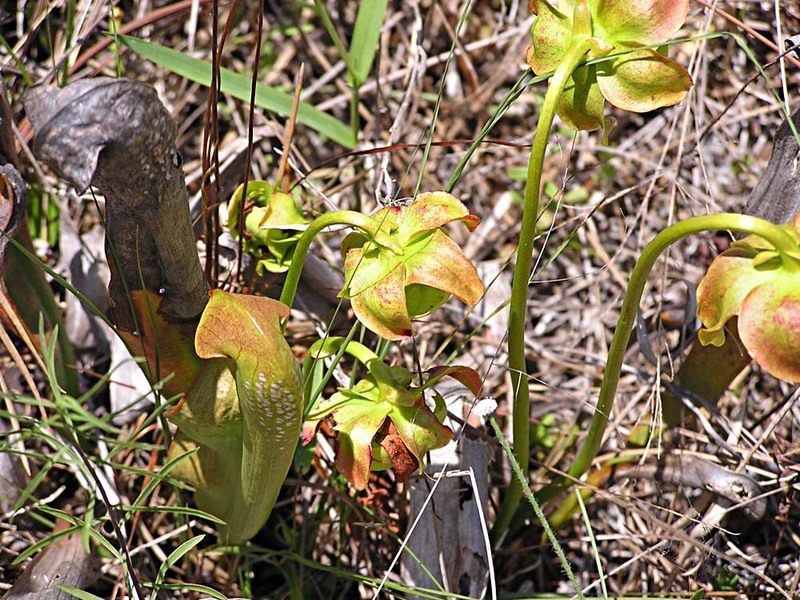 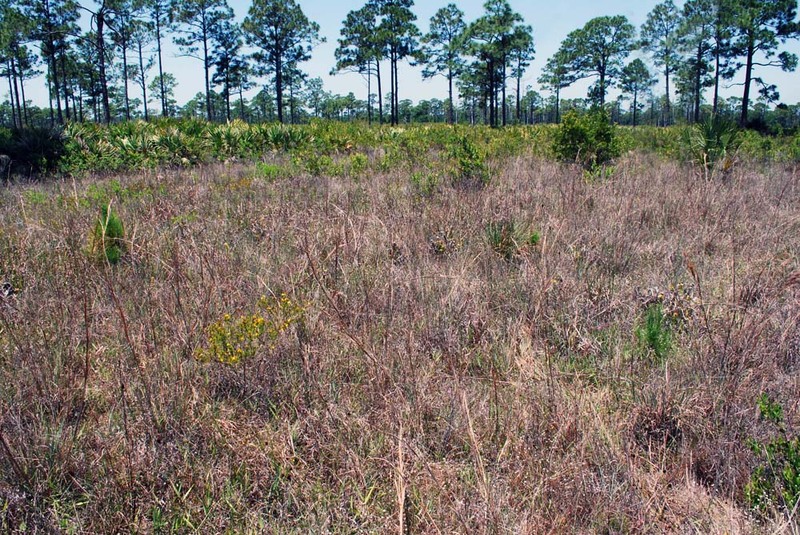 Many clumps of pitcher plants were located in the low area shown in the foreground in this photo. 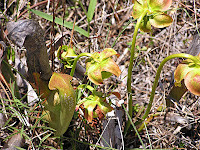 Although the ground was very dry today, the ranger said this time last year this area was wet and squishy—i.e., a bog, which is where pitcher plants are usually found. 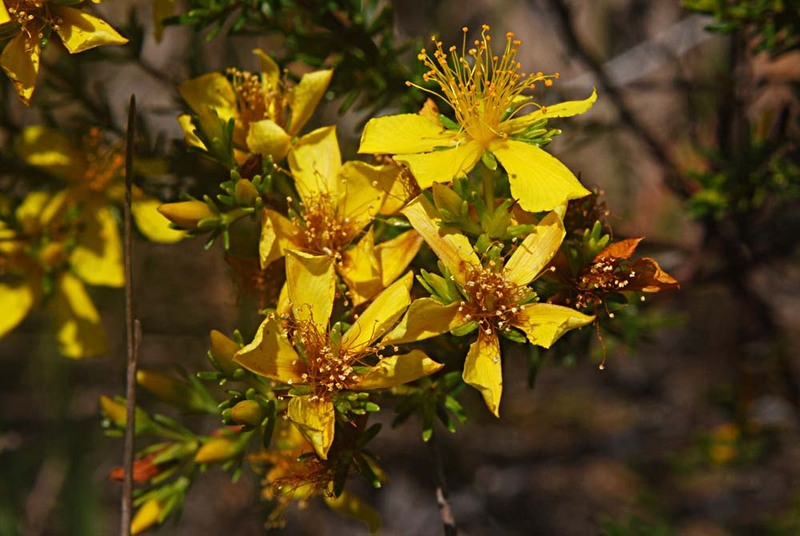 These six photos were taken by my wife, Julie, with an old Olympus C-740 compact, 3.2 Mp, digital camera, held together by rubber bands. 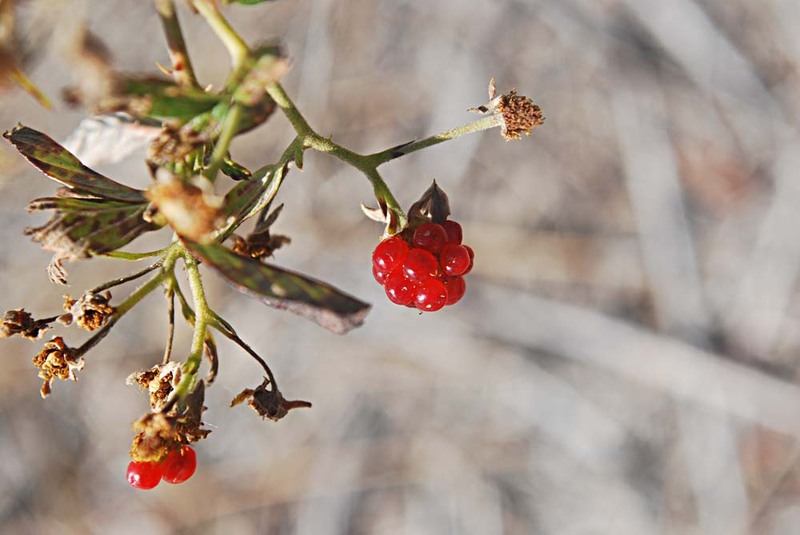 I took the above eight photos with my usual Nikon D60, 10.2 Mp SLR. 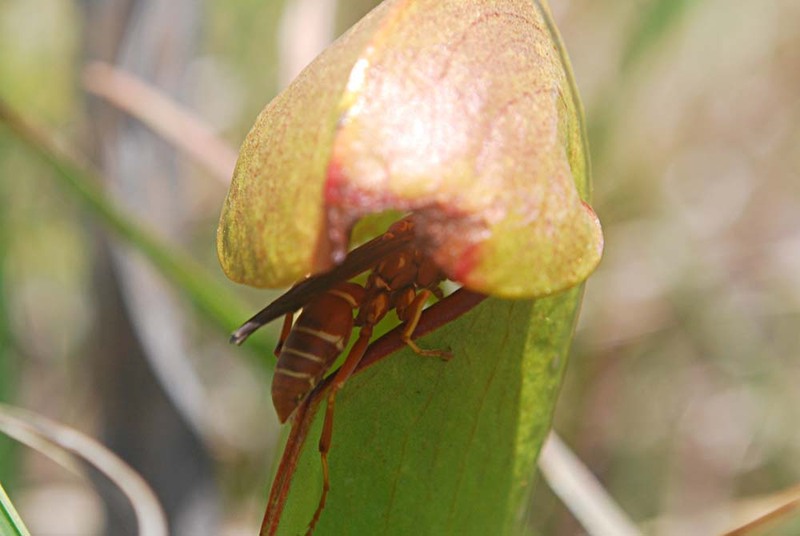 As I set up to take the next to last photo, a hornet slowly backed out of the pitcher plant hood. 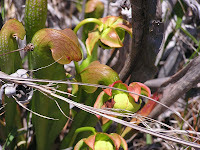 After a few seconds, the hornet went back in. 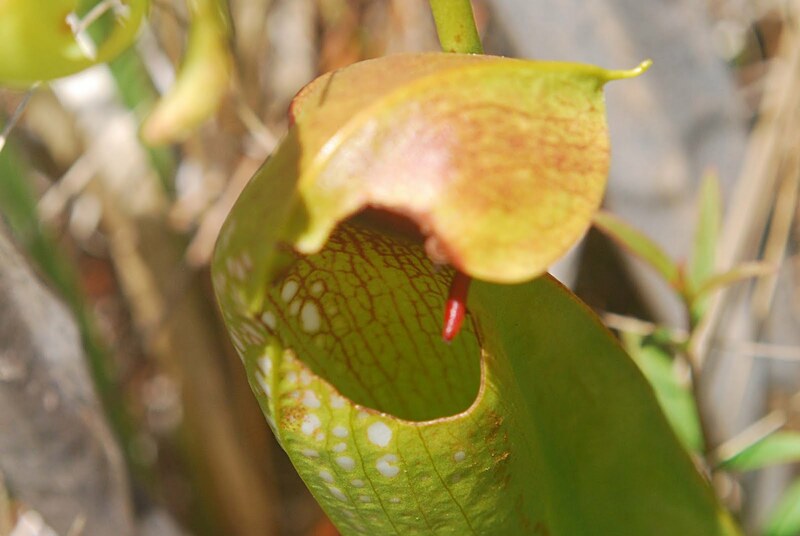 I'm not sure if the hornet was about to become a victim of the carnivorous plant, or if it was feeding on something (insects?) 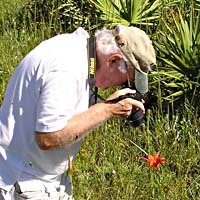 in the plant. 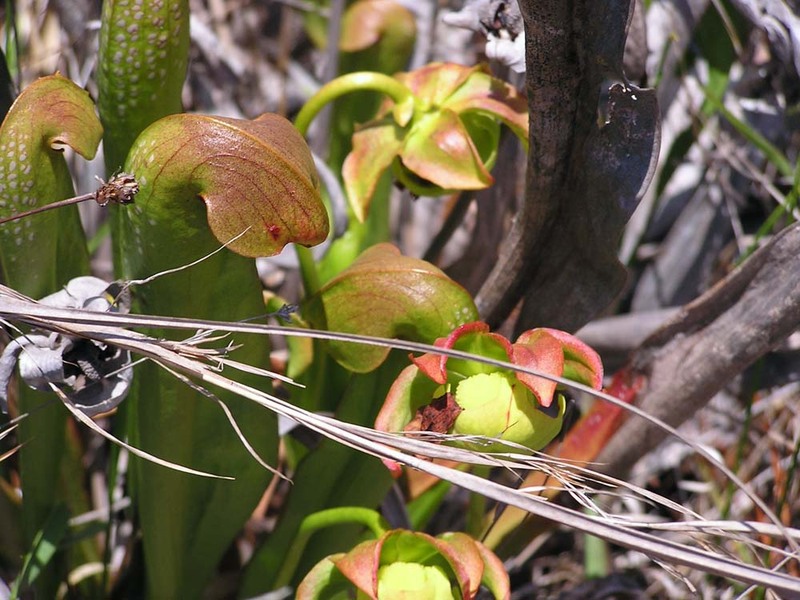 Maybe hornets are too large and powerful to be trapped by the pitcher plant. 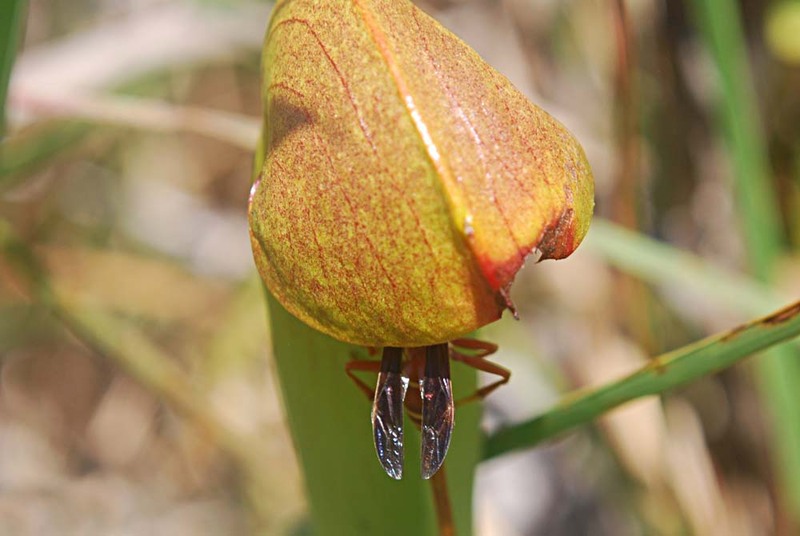 The ranger told us that a park biologist recently split open a pitcher plant and found that it was filled with love bugs! 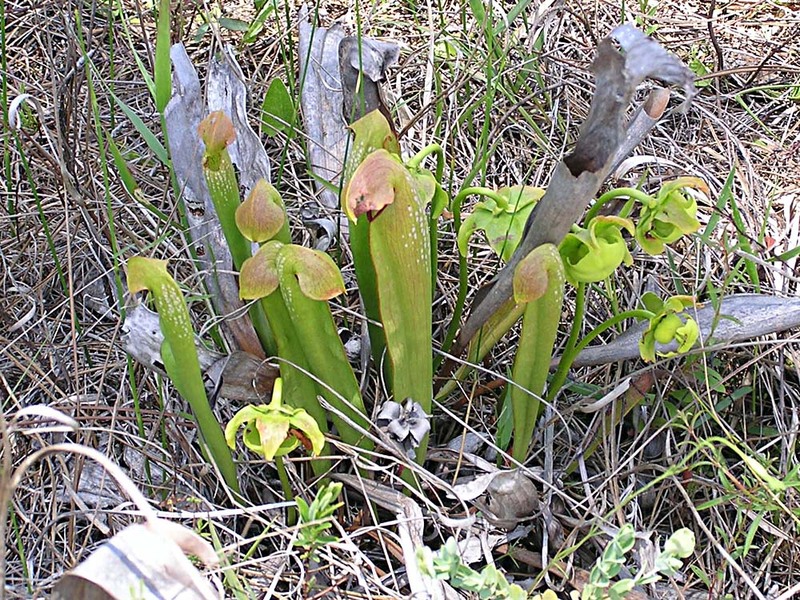 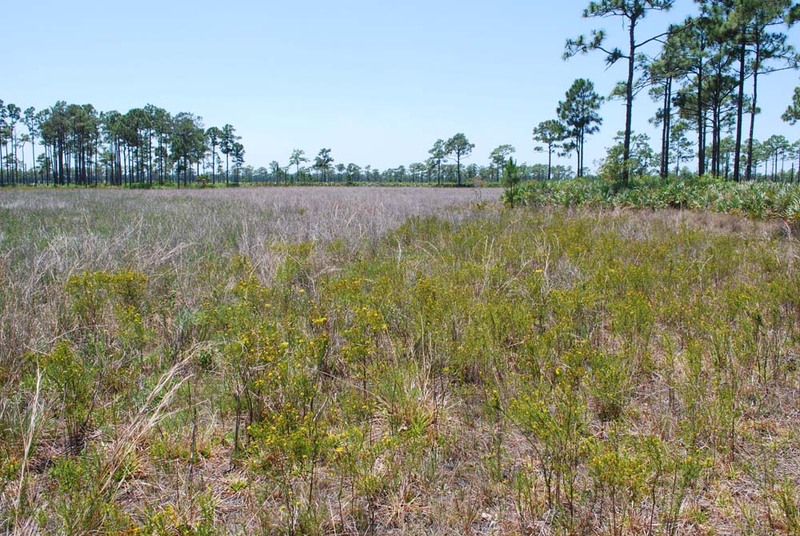 Several colicroot plants were growing in the "bog." These are the only ones I've seen outside of the boggy area in Wickham Park. 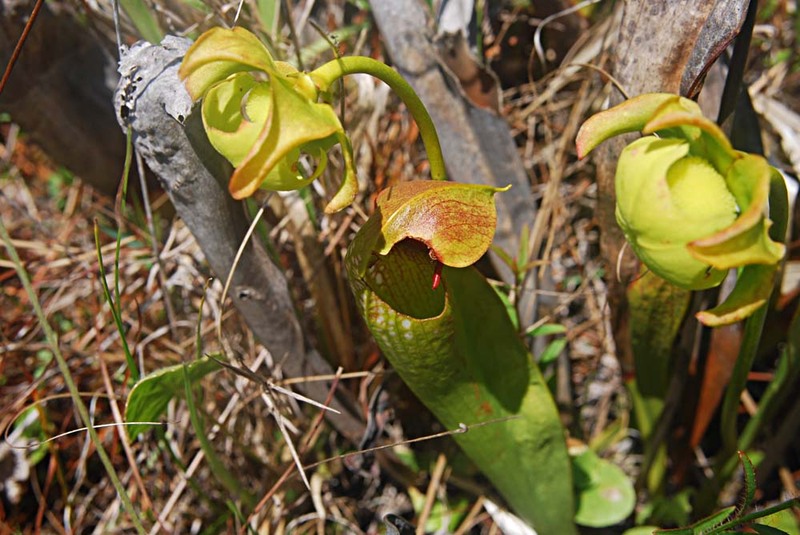 These plants also like bogs. 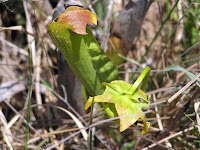 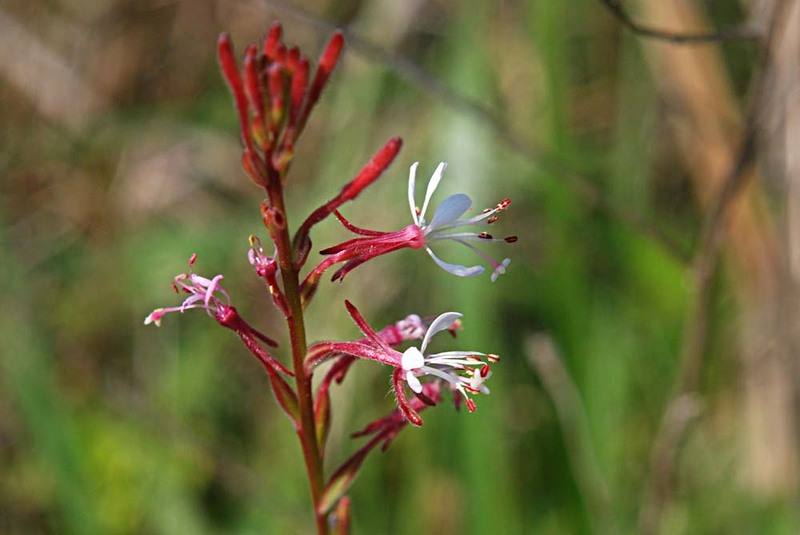 This is another plant usually found in boggy areas. 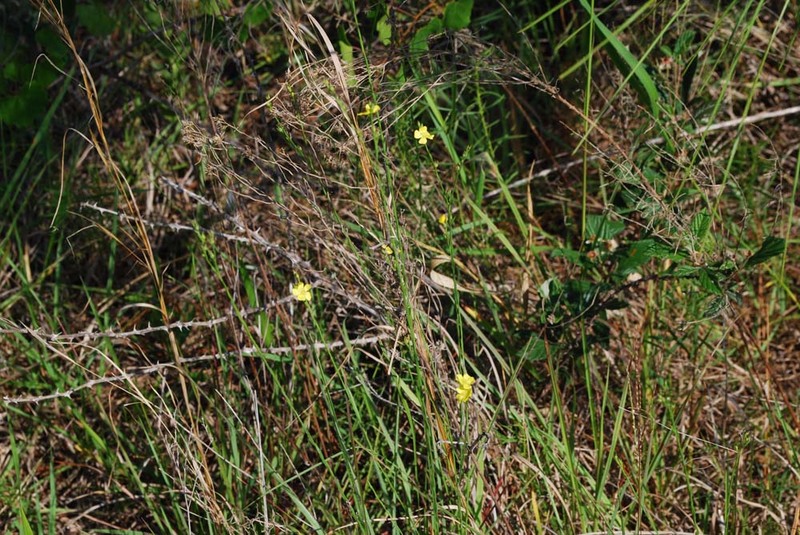 Also, saw meadowbeauty and hatpins, but did not photograph them. 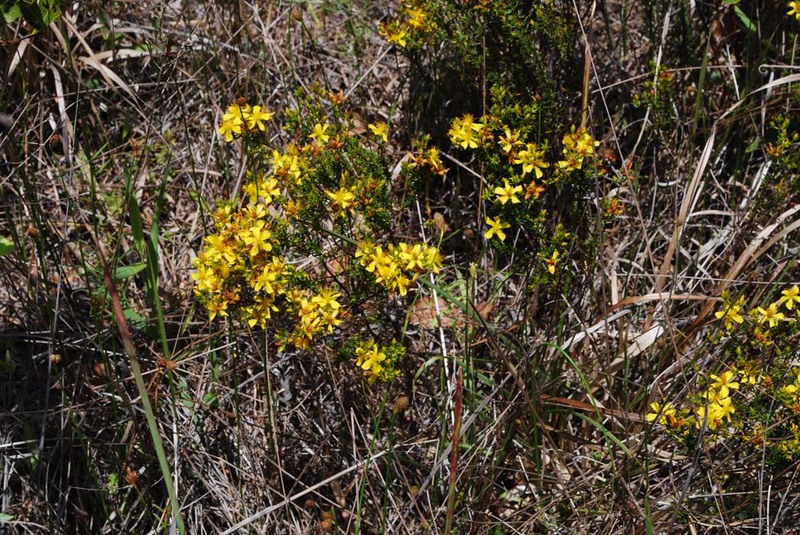 Nearby was this low area, bordered on one side by a large patch of St.John's-wort. 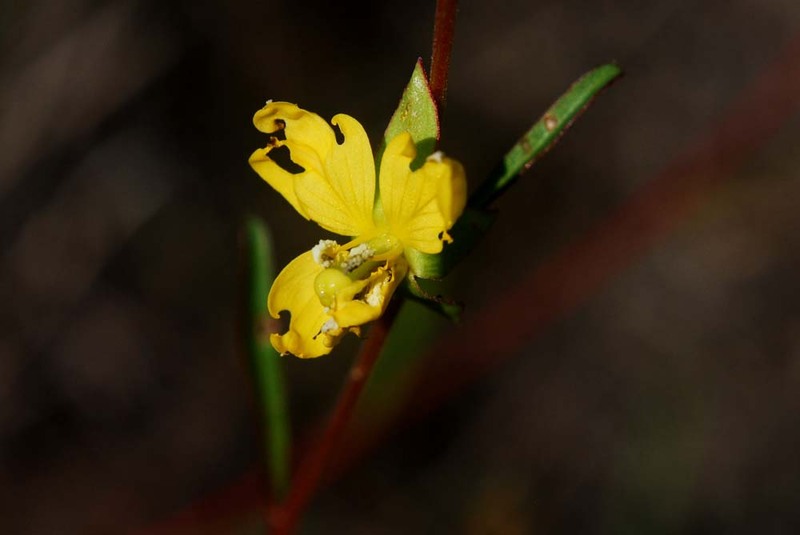 I didn't study the plants closely, but they had small, needle-like leaves, which suggests Hypericum tenuifolium. 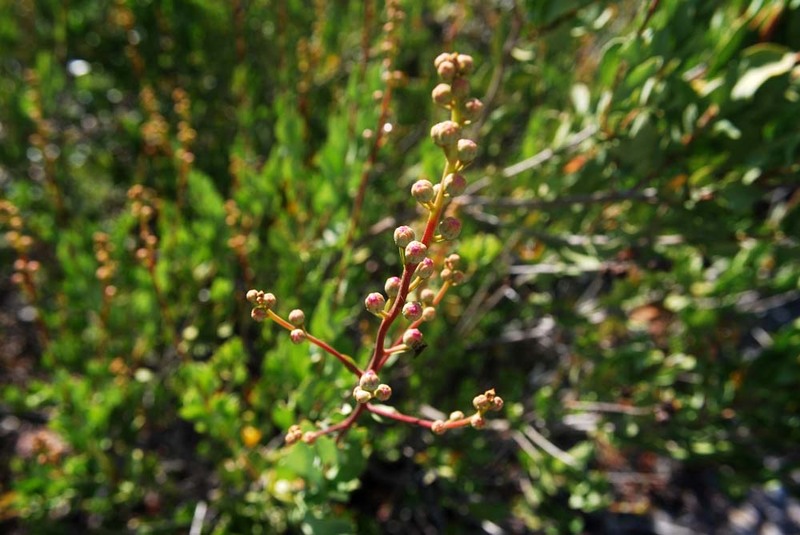 Made a quick visit to Malabar Scrub Sanctuary and then drove west to the Three Forks Marsh at the end of Malabar Rd. 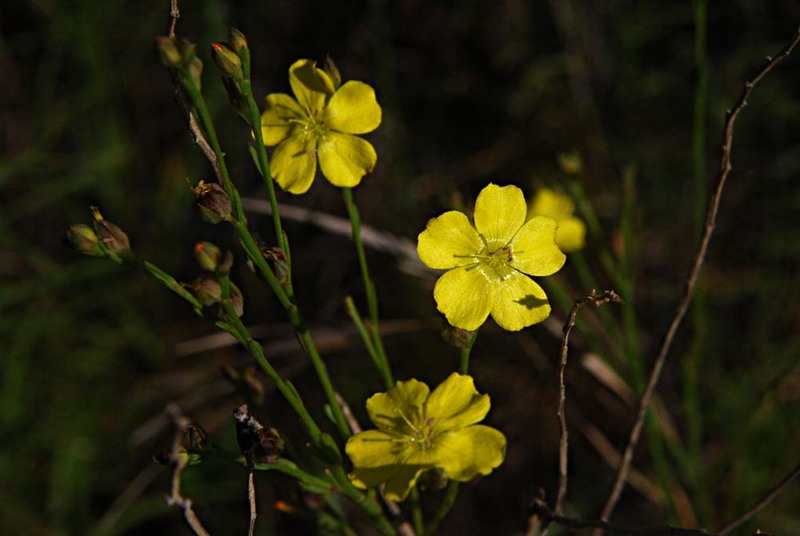 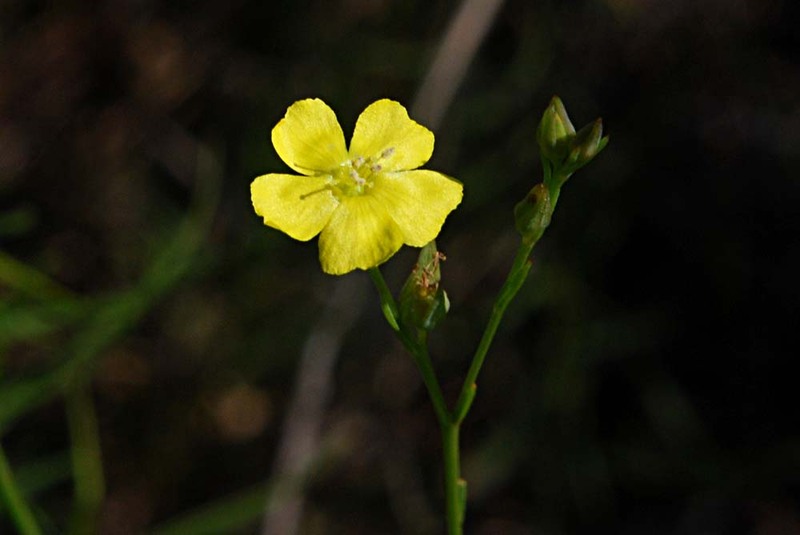 Found one wildflower new to me: Florida yellow flax, in Malabar Scrub. 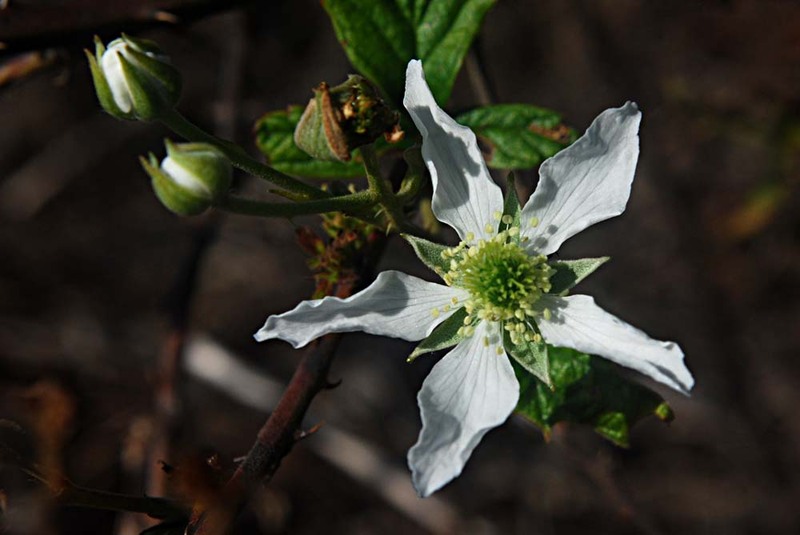 No flowers, yet—only sticky buds. 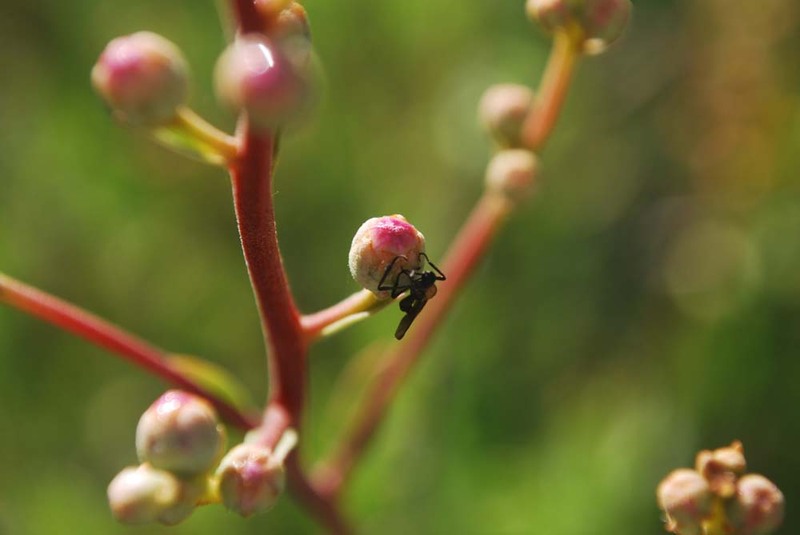 A love bug was stuck on one bud (the air was thick with them). 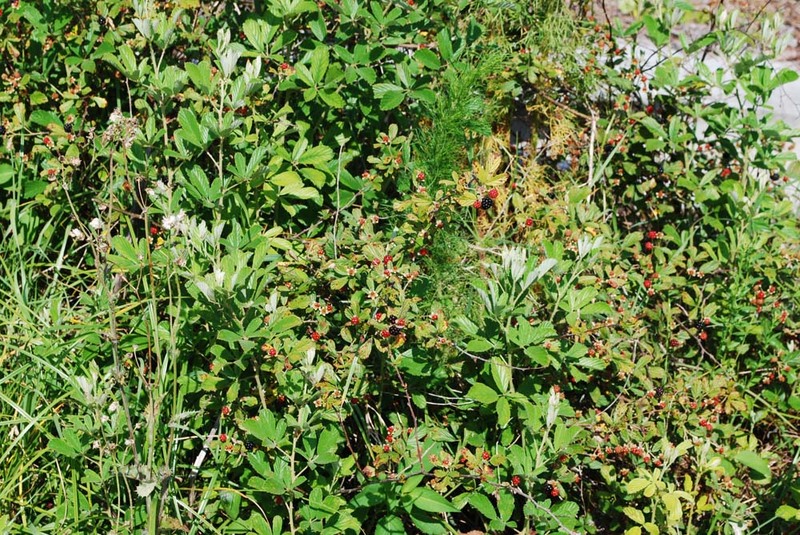 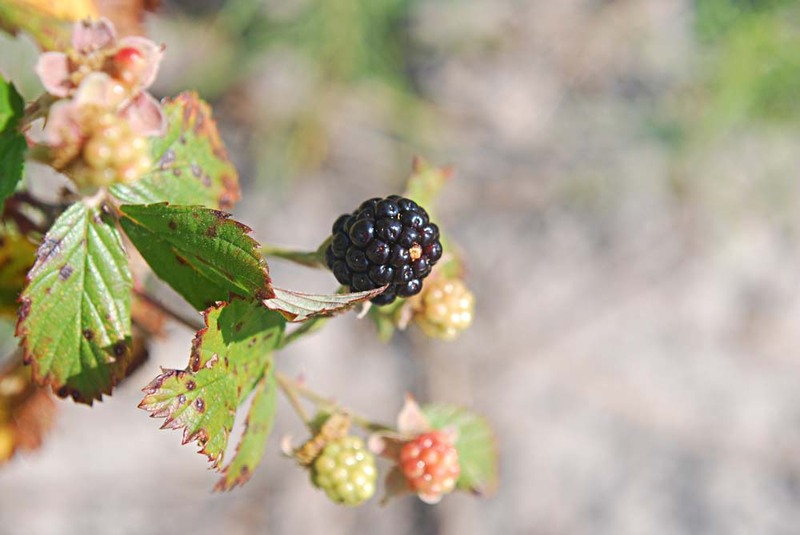 Lots of blackberry bushes along the concrete road, and they're beginning to ripen. 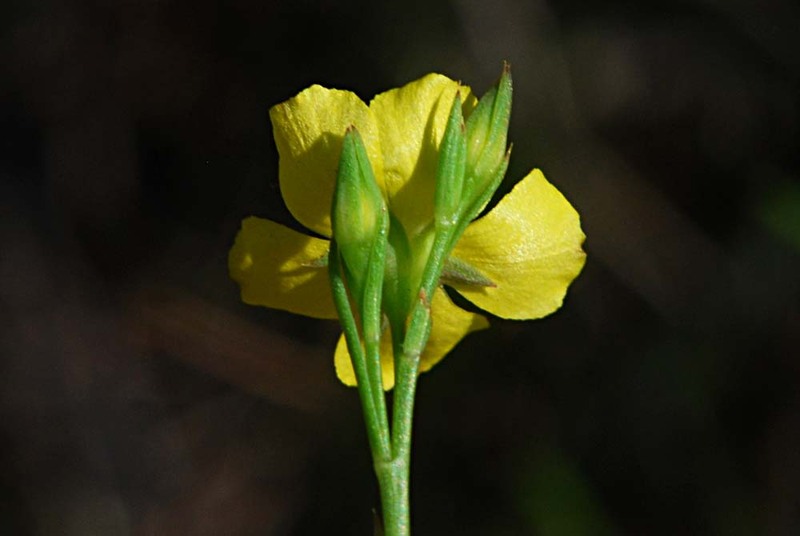 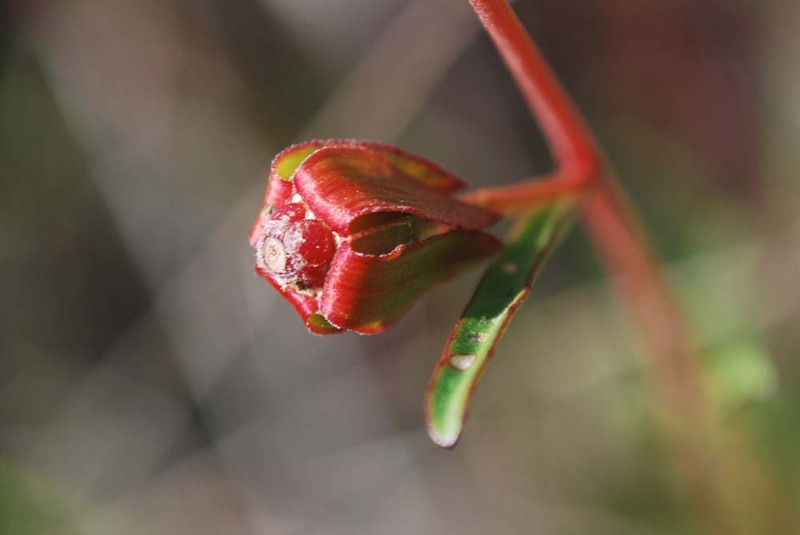 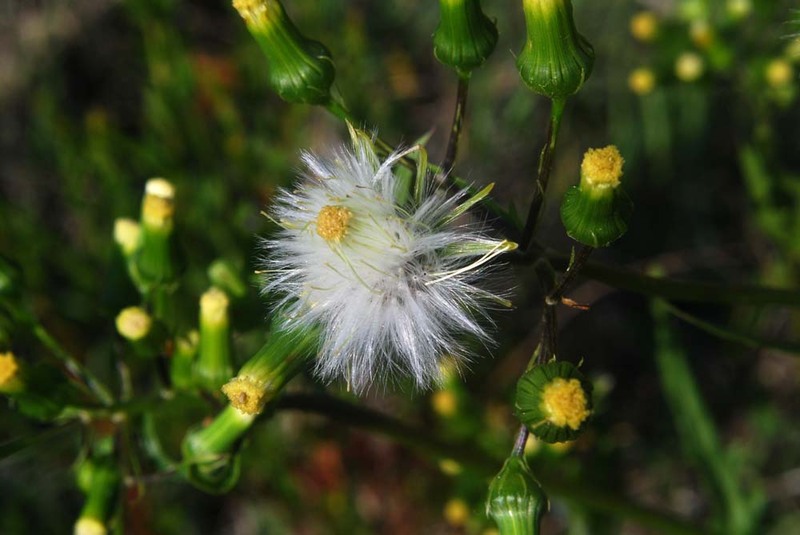 Insects had nearly destroyed the only blossom, but the plant could still be identified by its cube-shaped seed capsule. 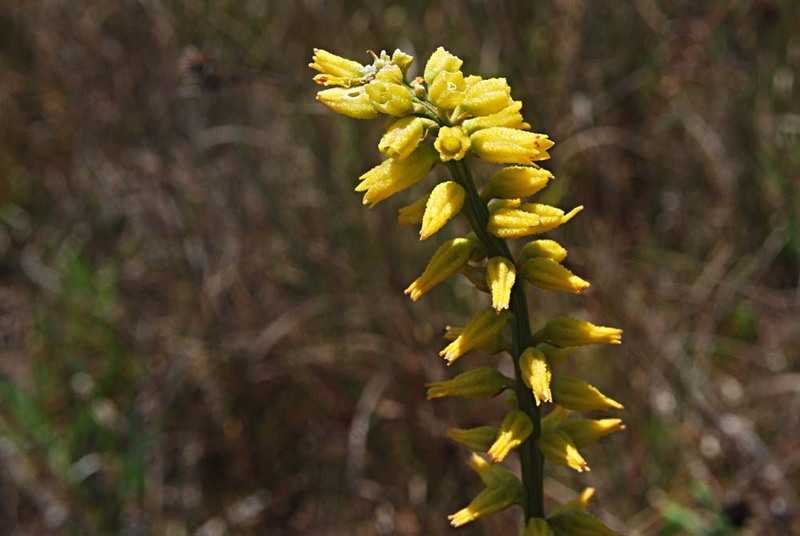 The inflorescence of this plant is a raceme, usually divided into female flowers on the lower part and male on the upper. 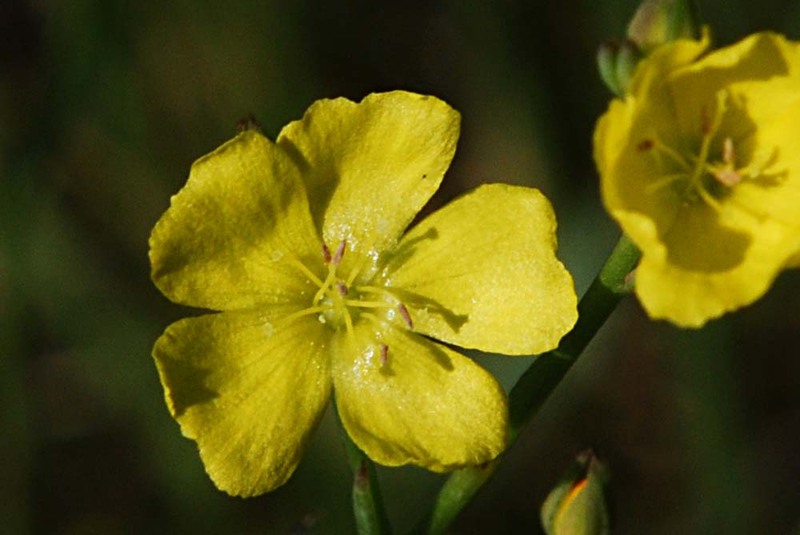 A female flower is shown on the left and a male on the right. 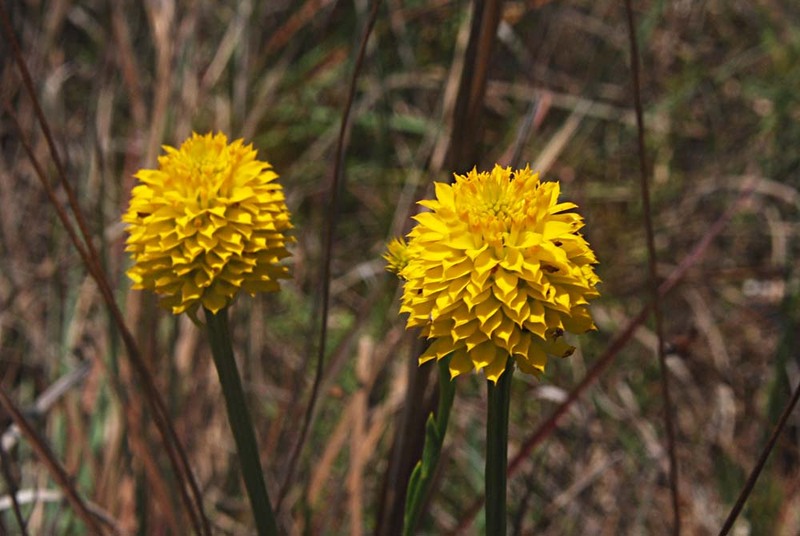 This was a new wildflower for me. 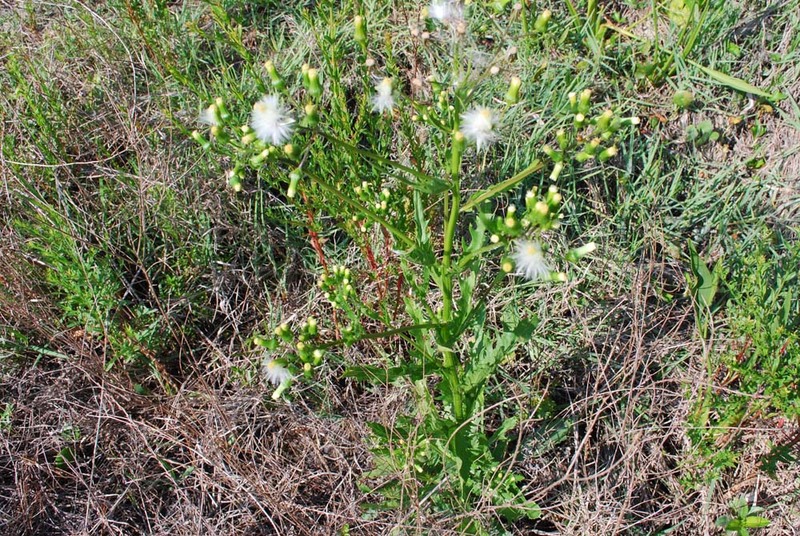 It's found throughout most of the state and the southeast US. 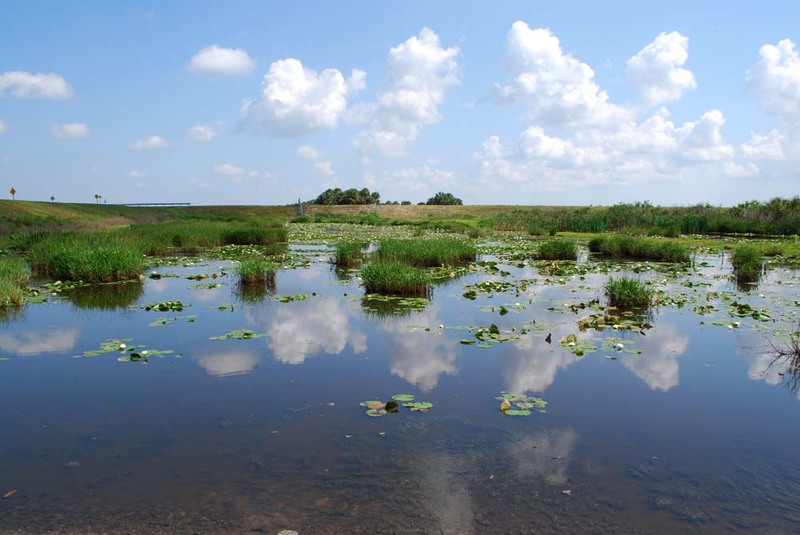 White waterlilies (Nymphaea odorata) and yellow spatterdocks (Nuphar advena) in canal near the boat ramps. 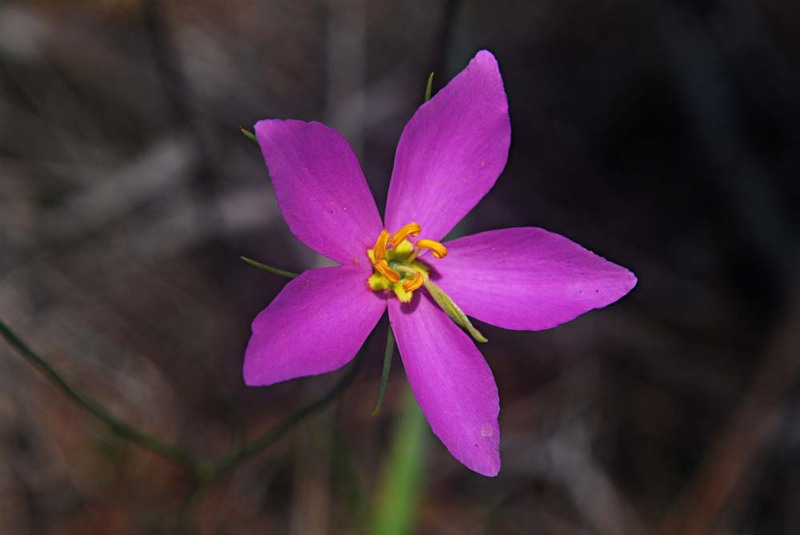 Bright pink purslane was scattered along the edges of the berms.